This Month few movies blasting Box Office. No doubt in number 1 is Baahubali 2, Fantasy story with massive use of graphics entertaining public a alot. People comming for watching again and again for this movie. 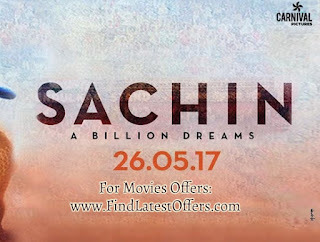 A most awaited movie of Sachin's fan hits the box office. Documentary · A tale of a small boy with dreams and his journey to becoming the God of Cricket and the most celebrated sportsperson in his country. Book 2 or more movie tickets using code BMS125 on BookMyShow and get up to Rs.125 off, or 50% off on transaction value, whichever is lower. Book movie ticket using code MOVIES100on Paytm ang get upto 100 cashback.